Smart M2M devices require authentication & registration with the mobile network. Standardisation of service is proposed by the ETSI Service Capability Layer deployed to the Mobile Internet Device / Gateway. Security between the network and the mobile internet device requires authentication, key agreement and establishment that enable M2M Service Bootstrap, provisioning and M2M Service Connection procedures that are grounded on a clearly defined key hierarchy of the M2M Node. 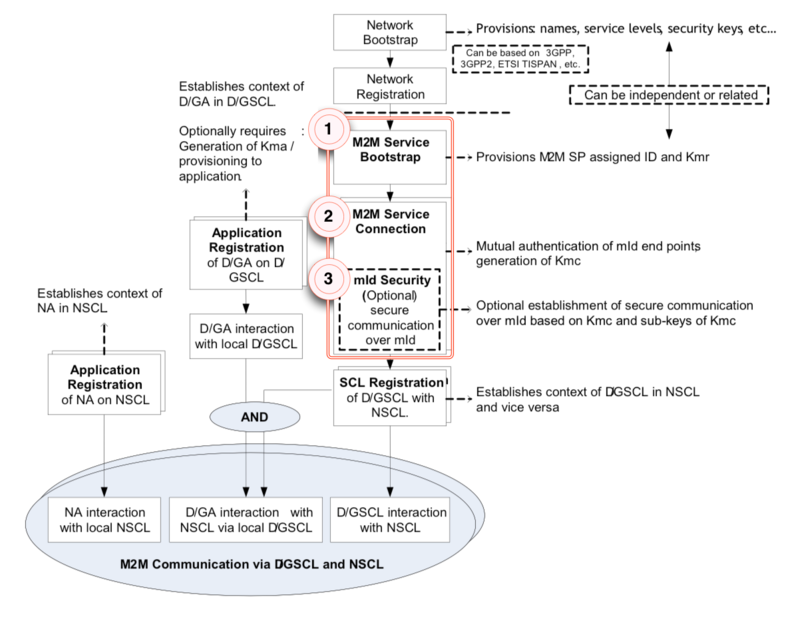 The SCL is deployed to the M2M mobile Internet device (mId) / gateway and requires authentication & registration with the M2M network. ETSI M2M provides standardised security mechanisms for the reference point mId. Mobile Internet Devices/gateways hold secret keys protecting the connection in a “secured environment” and are provisioned with the key M2M Root Key (Kmr).